Salinity is one of the major factors contributing in land degradation, disturbance of soil biology, a structure that leads to unproductive land with low crop yield potential especially in arid and semiarid regions of the world. Appropriate crops with sufficient stress tolerance capacity and non-conventional water resources should have to be managed in a sustainable way to bring these marginal lands under cultivation for future food security. 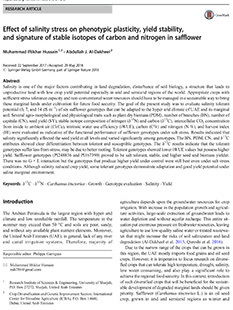 The goal of the present study was to evaluate salinity tolerant potential (0, 7, and 14 dS m−1) of six safflower genotypes that can be adapted to the hyper arid climate of UAE and its marginal soil. Several agro-morphological and physiological traits such as plant dry biomass (PDM), number of branches (BN), number of capitula (CN), seed yield (SY), stable isotope composition of nitrogen (δ15N) and carbon (δ13C), intercellular CO2 concentration from inside to ambient air (Ci/Ca), intrinsic water use efficiency (iWUE), carbon (C%) and nitrogen (N %), and harvest index (HI) were evaluated as indicative of the functional performance of safflower genotypes under salt stress. Results indicated that salinity significantly affected the seed yield at all levels and varied significantly among genotypes. The BN, PDM, CN, and δ13C attributes showed clear differentiation between tolerant and susceptible genotypes. The δ13C results indicate that the tolerant genotypes suffer less from stress, may be due to better rooting. Tolerant genotypes showed lower iWUE values but possess higher yield. Safflower genotypes (PI248836 and PI167390) proved to be salt tolerant, stable, and higher seed and biomass yielder. There was no G × E interaction but the genotypes that produce higher yield under control were still best even under salt stress conditions. Although salinity reduced crop yield, some tolerant genotypes demonstrate adaptation and good yield potential under saline marginal environment.